Fourth and youngest son of Saul, and, as the sole male survivor in direct line of descent, his legitimate successor to the throne (II Sam. ii. 8 et seq.). His original name was "Esh-baal (= "man of ba'al" [then, Yhwh]; see I Chron. viii. 33, ix. 39). But when the developed religious consciousness of the Prophetstook exception to the identification of "Ba'al" with "Yhwh" (comp. Hosea ii. 18, 19; ix. 10; Jer. iii. 24, xi. 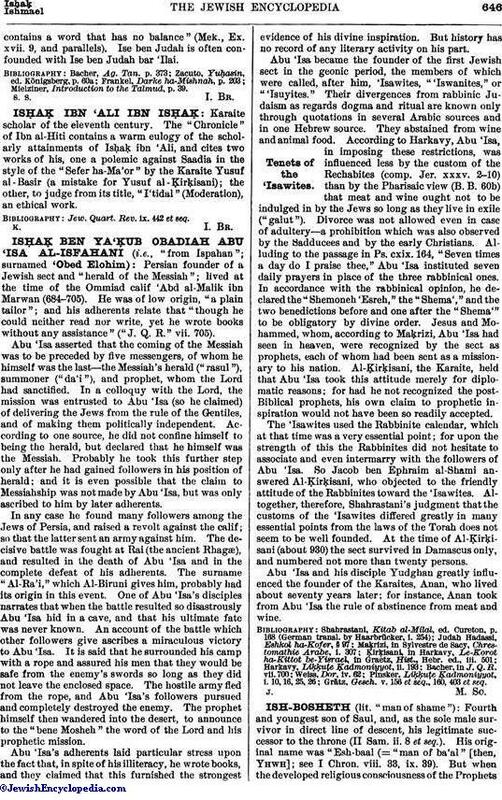 13), names containing "ba'al" were changed (though not consistently), as in this case, by substituting for the objectionable element the significant and contemptuous word "boshet" (comp. "Jerubboshet" for "Jerubba'al" [see Gideon, Critical View]; "Mephi-boshet" for "Meribba'ai"), or, as in I Sam. xiv. 49, by making some other substitution ("Ishui" [Hebr. "Yishwi" = "Ishyo"] for "Ishba'al"). Under the protection of his uncle Abner, Ish-bosheth became king in opposition to David, and resided in fortified Mahanaim, east of the Jordan, that place being secure against the Philistines, whose power it was necessary to break before he could think of taking up his residence west of the Jordan. The skill and fidelity of Abner succeeded in securing for Ish-bosheth the allegiance of all the tribes west of the Jordan with the exception of that of Judah. He is credited with having reigned two years (II Sam. ii. 8-10); but they probably must be reckoned to cover only the period after the subjection of the West Jordanic tribes, and not the preceding longer term during which he was recognized as ruler by the eastern section alone. 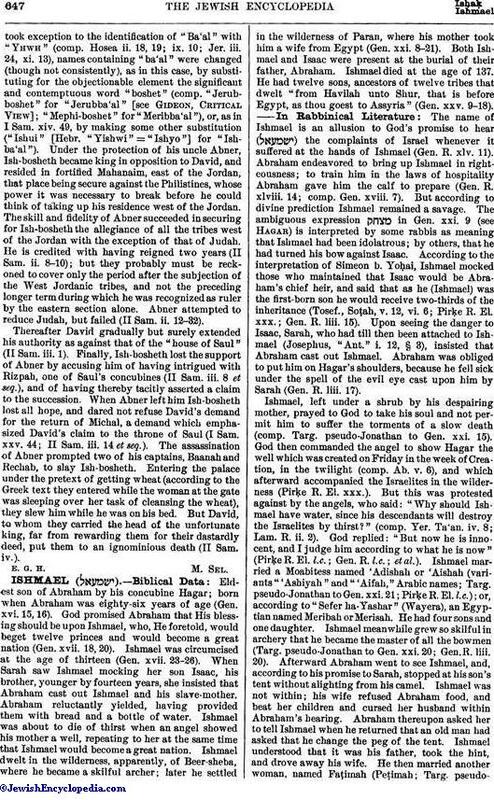 Abner attempted to reduce Judah, but failed (II Sam. ii. 12-32). Thereafter David gradually but surely extended his authority as against that of the "house of Saul" (II Sam. iii. 1). Finally, Ish-bosheth lost the support of Abner by accusing him of having intrigued with Rizpah, one of Saul's concubines (II Sam. iii. 8 et seq. ), and of having thereby tacitly asserted a claim to the succession. When Abner left him Ish-bosheth lost all hope, and dared not refuse David's demand for the return of Michal, a demand which emphasized David's claim to the throne of Saul (I Sam. xxv. 44; II Sam. iii. 14 et seq.). The assassination of Abner prompted two of his captains, Baanah and Rechab, to slay Ish-bosheth. Entering the palace under the pretext of getting wheat (according to the Greek text they entered while the woman at the gate was sleeping over her task of cleansing the wheat), they slew him while he was on his bed. But David, to whom they carried the head of the unfortunate king, far from rewarding them for their dastardly deed, put them to an ignominious death (II Sam. iv. ).